When you want to keep something safe, chances are that you’re going to go the extra mile to make sure it stays away from prying eyes. If you’re storing your belongings in a closet, shed, or cabinet, you will want to install a lock. Of course, the run-of-the-mill lock isn’t going to do. If you want to make sure no passerby with some lock-picking skills could possibly jimmy your lock, you’ll want something a little more high-tech. There’s nothing quite so personal as a fingerprint. 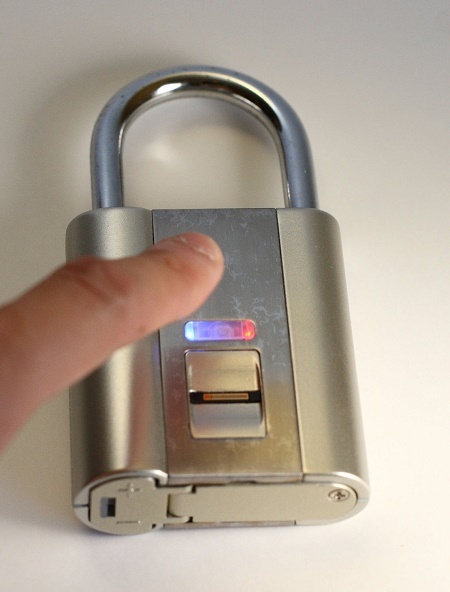 Everyone has a unique one just like snowflakes, which means a biometric scanner is the perfect way to lock or unlock a padlock without the fear that someone else can break in. The iFingerLock Fingerprint Biometric Padlock can give you and nine other people access to whatever you might want to keep secret or safe. This needs 2 AAA batteries to function, and will give you plenty of warning if it’s about to lose power. The body is made of a zinc alloy and the shackle is stainless steel. It’s meant for indoor use only, so make sure it’s in a place that can’t be affected by rain, snow, or drastic temperature changes. While this $114.99 purchase seems very exciting and is made of materials that make it seem like it would be almost impossible to crack, there are a few ways around this padlock. If any baddie knows this type of lock and you haven’t set all the keys, they’ll be able to set their fingerprint as one of the nine additional prints to be used. If you want to avoid that completely, you can always scan all of your fingers with one or two friends scanned in just in case. The only annoying aspect of this device is if you want to reset the prints, you’ll have to wipe all of them rather than one or two.